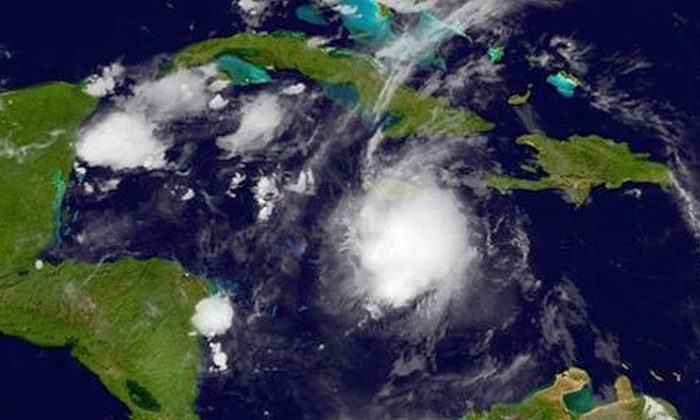 Weather officials say that Tropical Storm Earl has formed in the Caribbean as of Tuesday afternoon on Aug. 2. Warnings have been issued across Central America. Earl was found “in the northwestern Caribbean Sea,” the fifth tropical storm of the 2016 hurricane season, the U.S. National Hurricane Center (NHC) said at 12 p.m. ET. The governments of Mexico and Belize issued a Tropical Storm Warning and a Hurricane Watch for the eastern portion of the Yucatan peninsula from Punta Allen, Mexico, to Mexico’s border with Belize and Guatemala. Meanwhile, Honduras issued a Tropical Storm Warning for the entire northern coast of the country, from Cabo Gracias a Dios westward to the Honduras-Guatemala border, which includes the Bay Islands. Earl is currently centered about 215 miles south-southeast of the Grand Cayman and moving west at 22 mph. “On the forecast track, the center of Earl will be moving very close to the north coast of Honduras late tonight and Wednesday and [will] approach Belize and the Yucatan peninsula late Wednesday,” the NHC said in a Facebook post. Maximum sustained winds are near 45 mph with higher gusts. Before Earl reaches the Yucatan peninsula, the storm is predicted to strengthen even further. The NHC had been monitoring the “tropical wave” that strengthened into Tropical Storm Earl over the past week. Rain and winds from the wave hammered the Dominican Republic on Sunday and Monday, leaving at least six people dead when gusts knocked over power lines into a bus in Nagua. Around 12 more people on board were injured, Diego Pesqueira, a spokesman for the Metropolitan Transportation Authority said.